[dropcap]L[/dropcap]ast week in the East Los Angeles Civic Center there was some positive vibes rolling out, the reason for the jive: volunteers from “Familia Unida” decided to take it upon themselves to help wheelchair users clean their equipment. It was an entertaining event indeed, as a mariachi band was heard in the background of all the smiles that were being displayed that afternoon. 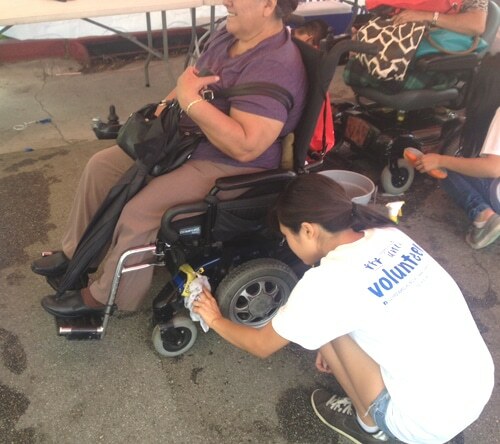 Community events like this “wheelchair wash” should be heavily publicized, to bring more attention to the idea of volunteering locally, to help people with disabilities, with respect and due diligence. We should not forget that people with disabilities deserve to be aided and entertained as much as the next person. This yearly Los Angeles event provides aid for both manual and power wheelchair users, some of these wheelchair users also repaired and washed other users chairs, which led to Familia Unida President Irma Resendez to say the following, "great example of how people with disabilities have many abilities". What do I do with my used wheelchair when I no longer need it?